Few saw it coming. 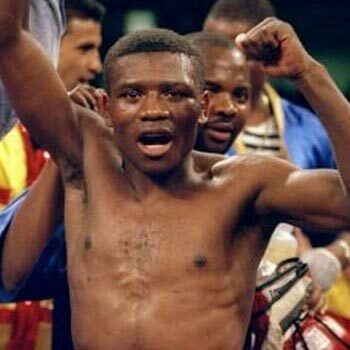 In a stunning upset, Fredrick Lawson of Ghana suffered a fourth-round TKO loss to Mexico’s Juan Ruiz Saturday night at 2300 Arena in Philadelphia, Pennsylvania. Lawson, who had recently signed a promotional contract with Bob Arum’s Top Rank Promotions, was expected to defeat Ruiz en route to bigger bouts on his new outfit. Ruiz (22-4, 14 KOs), not considered a hard puncher, entered the fight having lost four of his last five. Another defeat was expected here. Lawson, perhaps shaking off 13 months of rust, looked tentative in the first. Further, he entered the bout having suffered a sprained right wrist during camp that hindered him from using that punch. Lawson found his footing in the second, using that right hand to land flush blows on Ruiz’s jaw. His jab, however, was his primary weapon, and he used it judiciously. Lawson landed that punch often, but was slow to bring it back and would drop his hands immediately afterward—a flaw Ruiz repeatedly capitalized on. The action heated up in the third. The heavier shots came from Ruiz, who continued to land counter rights over Lawson’s jab. The Ghanaian was backing up now and Ruiz’s confidence was growing by the second. Ruiz was enjoying a solid fourth when he closed the show. A hard right to the temple caused Lawson to lose control of his legs. He crashed to the canvas, still badly wobbled as he rose to his feet. Referee Gary Rosato ruled that the fall came from the slip, but replays showed a punch landing and Lawson was still dazed as Rosato attempted to resume action. Ruiz poured it on, unloading a number of uncontested shots on Lawson, forcing Rosato to halt the bout at 1:15 of the fourth. So where does Lawson, now 27-2 (21 KOs), go from here? The once promising welterweight hasn’t impressed since his thrilling decision win over Breidis Prescott in 2015. Afterward, Lawson announced that he will continue to fight on but at what level remains to be seen.